I knew I shouldn't just dismiss the Severn Way on my brief experience. 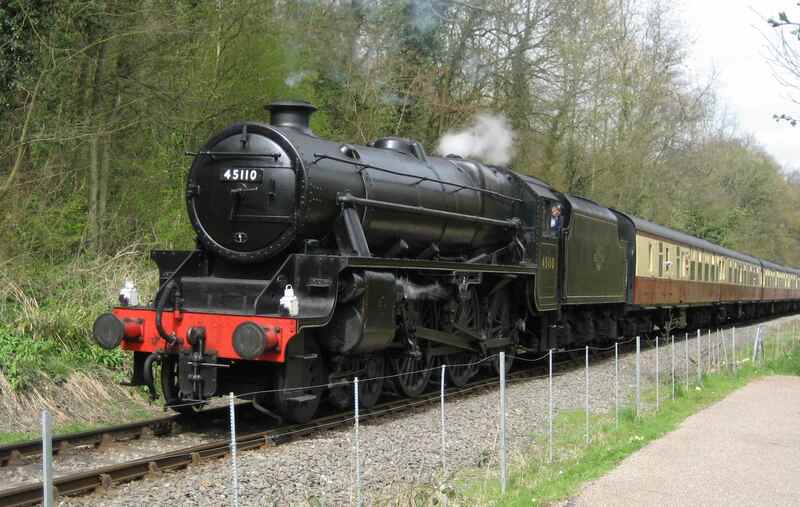 So I spent most of today on it, heading north from Bewdley. Here it hugs the east bank of the Severn (the Worcestershire Way follows the west). The trail is probably kinder here than I had experienced before, allowing quite rapid progress. 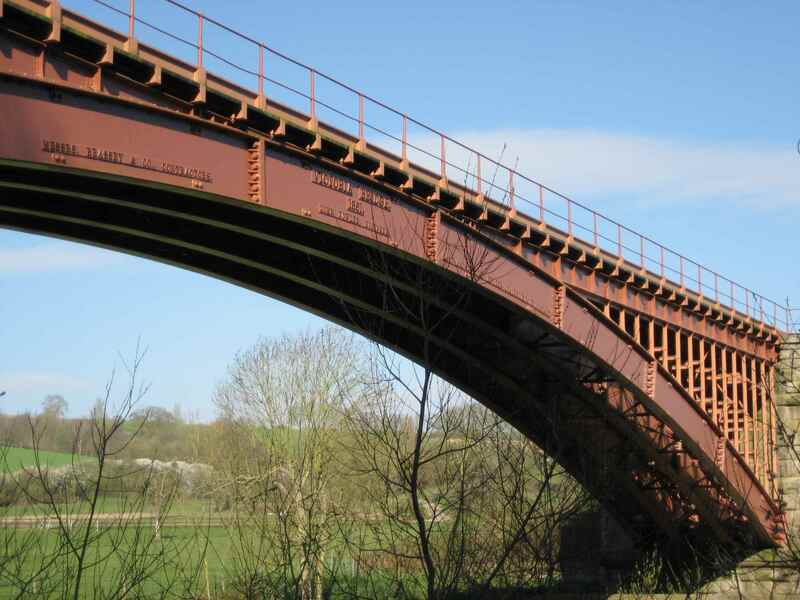 It passed under the Victoria Bridge, a fine 150-year old iron railway bridge; how did they manage to make such massive curved I-beams? Later, at Upper Arley, the Way continues on the west of the Severn, after crossing a pedestrian bridge. At Upper Arley, some long-distance hikers decide to leave the Severn and head northeast, taking first the Heart of England Way and perhaps later visiting the Peak District and following the arduous Pennine Way to the Scottish border country. I decided to continue more directly north, and the Severn Way headed nicely in that direction. But although affording fine views of the busy, steam-powered Severn Valley Railway carrying day-trippers on this holiday weekend, and although the Severn scenery became more interesting with islands, weirs and country parks . . . despite these plus-points, the trail itself had intermittent segments of mud, fallen trees, and an ever-meandering path. I started to weary of it, not just for the slowness of it, but also because the roots, rocks and uneven surface could easily lead to a twisted knee or ankle. So, when the chance came, I diverted to the Mercian trail, with a surface fit for bikes and thus for walkers too, and eventually passed a second reservoir of the day, this one with sailing boats, and made my way by country roads to Bridgnorth. Along the way, I had several friendly chats. Though the British do not always start a conversation enthusiastically, or make relaxed eye contact at first glance, they are nearly always polite and helpful, and warm up to "friendly" quite soon. Of course, my own appearance is a factor in these exchanges. Up until yesterday, I wore jeans and a wool hat. My backpack was a nondescript dark gray, and my coat was black. It would be easy to mistake me for a vagrant - and, partly for this reason, some people may have shied away from answering my route or where-is-accommodation questions. Women, in particular, would often grab at their cellphones when they saw me about to ask a question. If the good Lord had told the parable of the Good Samaritan (Luke 10:25-37) today, people would not only have passed by the wounded man on the other side of the road to Jericho, but would have “grabbed at their cellphones”! I started to feel like a social outcast whenever people shied away from a friendly approach. With this in mind, and in the nice weather now in place, I dressed in boy-scoutish shorts today, which nicely exposed my hiking boots, knee supports and spindly legs. I wore a peaked hat (cap) instead of the wool one whose shape resembled a Dickensian sleeping hat. I could hardly have looked more like a dorkish hiker if I had hung a harmonica around my neck, carried a yodeling instruction book and sported a Tyrolean feathered hat. And I think it worked; people seemed friendlier! As they say, you only get one chance to make a first impression. I decided to try this outfit for as long as the weather allowed. It was forecast to stay sunny until Friday or so, today being Monday. That's also the reason that I delayed taking another rest day. Perhaps I can rest on some rainy day, and be lucky enough for it to clear the day after. Bridgnorth was nominally 19 miles per the road and trail signs, but I calculated rather less. As I arrived, I discovered a high town and a low town, with a steep ridge and funicular railway between the two. It's an old town with a commensurate number of tourists over this Easter weekend, and it wasn't easy to find accommodation. I had to pay a bloated price for B&B at the Golden Lion Inn. 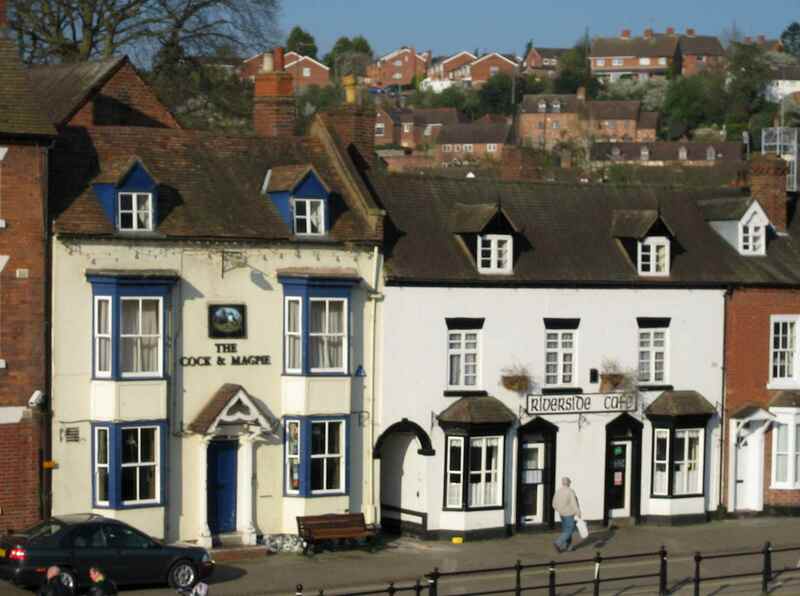 Later, on my way to a popular fish-and-chips shop on Listley St, I tried for a wifi hook-up at Bridgnorth's New Inn (not to be confused with Tewkesbury's), but it was another place that didn’t seem to have the service as advertised. It was about a week since I accessed my email, and matters were rapidly progressing towards the dénouement with BT that I described earlier. 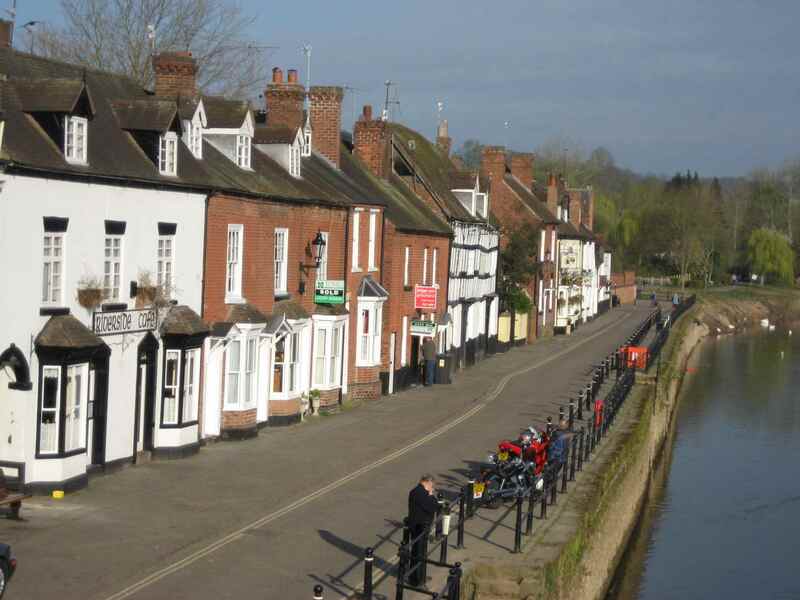 I had never heard of Bridgnorth before making my route plans. Britain has no end of fine towns and villages like this. Not enough of them enter the consciousness of visitors who race by to just the better-known ones. "The Roundheads was the nickname given to the supporters of Parliament during the English Civil War. Their enemies, the Royalist supporters of King Charles I, were nicknamed the Cavaliers. "Some of the Puritans, but by no means all, wore their hair closely cropped round the head, and there was thus an obvious contrast between them and the men of courtly fashion with their long ringlets. "During the war and for a time afterwards Roundhead was a term of derision - in the New Model Army it was a punishable offence to call a fellow soldier a Roundhead. The name remained in use to describe those with republican tendencies until after the Glorious Revolution of 1688. "Roundhead appears to have been first used as a term of derision, towards the end of 1641 when the debates in Parliament on the Bishops Exclusion Bill were causing riots at Westminster. One authority says of the crowd which gathered there: "They had the hair of their heads very few of them longer than their ears, whereupon it came to pass that those who usually with their cries attended at Westminster were by a nickname called Roundheads." Today, the county of Shropshire is known for its natural beauty. It was once called Salop, and that name still abounds on street and pub names, and in referring to people from these parts as Salopians and the county's mailing address as Salops. In nearby Shrewsbury, a notable walled city on a hill, there’s a famous public school, whose alumni are known as Old Salopians. One such alumnus is Charles Darwin. There is some history that interests me about Charles Darwin. It starts with his father, Robert, a wealthy doctor in Shrewsbury who studied medicine at Leiden University in Holland, and later graduated from Edinburgh University at the young age of twenty. An imposing man and an atheist, Robert reputedly stopped weighing himself when he reached 335 lb – and imposing as he was, weightily prevailed upon his son Charles to move on from Shrewsbury School to also study medicine at Edinburgh University. Charles was not, however, a willing medical student. He hated the sight of blood, and departed Edinburgh without graduating – but not before studying anatomy as medical students do to start. Ever a pragmatist, Robert then sent Charles to Cambridge University to study for a degree in theology from where he could buy a place in the Anglican Church and lead a gentleman’s existence as a minister with a dark secret – atheism! At Cambridge, Charles also studied life sciences. It was his atheism, science, and knowledge of anatomy, which provided the background that allowed him to dissect and disprove the church’s argument for creativity, and instead derive the breakthrough theory of evolution. From this confused personal background, but imbued with self-knowledge and a significantly broad and deep education, Darwin achieved greatness. The awe-inspiring accomplishments of Charles Darwin made my own Shropshire journey seem quite insignificant. Tomorrow’s destination was Telford. I spent time with my maps tonight locating the best part of town to find accommodation that fitted the following day's hike - somewhere north of Telford, so as to try to shorten the distance to Market Drayton, my aiming point beyond Telford and seemingly a harsh distance from it. Finding a route that offered accommodation choices at day-walk distances was one of my challenges. It beat solving office problems.